Have you ever been tasked with a project that you know has been done before, probably thousands of times, but you didn’t know where to start because it was new to you? If you’re nodding your head yes, you’re not alone. The fact is, we all have. Almost two years ago, Andy Leonard invited me to be part of a book project. He had a vision of compiling a “recipe book” of common tasks that nearly every ETL professional encounters at some point in his or her career. Whereas most technical books explain how to use the product or specific features, Andy wanted to create a pattern-oriented book that would help jumpstart an SSIS project. 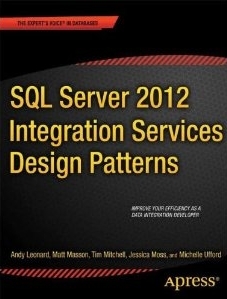 The book is aptly titled “SQL Server 2012 Integration Services Design Patterns” and is out today. My contributions are the Metadata Collection and Parallel Data Warehouse (PDW) chapters. You can purchase the book at Amazon or directly from Apress. The whole gang and I will be presenting a precon at PASS Summit 2012 that will explore SSIS Design Patterns in detail. I will write another blog post once I have decided on the particulars of what I’ll be presenting on. In the meantime, suffice it to say if you work with or around SSIS, this will be a precon you won’t want to miss. My apologies to anyone I may have missed.